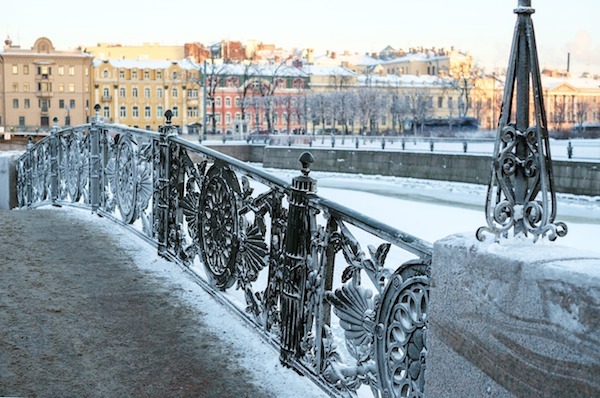 This route through older sections of central St. Petersburg features some of the city’s most historic and architecturally intriguing sites, all while offering great views of the Neva River from its bridges and embankment paths. Most of the route is along the river, where there are wide walking paths or sidewalks. Start out near the Bronze Horseman statue, which sits between the Admiralty Embankment and Aleksandrovskiy Sad in the south side of the Neva River, near the Hermitage. Head east along the embankment for about 3 km, past the Winter Palace, the Marble Palace, and the Summer Gardens, to the Liteynyy Bridge. Cross the river and take a left onto the sidewalk to Sampson Bridge. Go left again and follow the path along the water, passing Troitskiy Bridge. 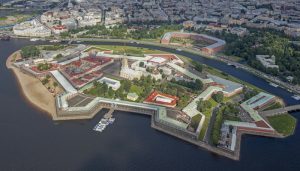 Shortly after, you’ll reach the wooden Ioannovskiy Bridge, which leads to an island and the Peter and Paul Fortress, at the 6 km mark. You can get right down to the water here–even a small beach!. Take a left to stay on the waterfront and circle the island to Kronverkskiy Bridge, at the 8 km mark. Cross again and take another left. You’ll pass Letuchiy Gollandets (the famous three masted Flying Dutchman) right before Birzhevoy Bridge. Cross and wrap left around the spit towards University Embankment and Blagoveshchenskiy Bridge. This is your final bridge crossing! Take a left onto English Embankment and all the way back to Bronze Horseman. Add-On/Variety: The run can be shortened by using some of the other bridge crossings (Palace Bridge, Troitskiy Bridge). You can also do a jaunt around the Summer Garden, Field of Mars, area just south of Palace Embankment).